Eco Bella Bakery is located in Rochester's South Wedge neighborhood. If you're driving down South Avenue heading from Highland Park to downtown, you can find it between Caroline Street and Gregory Street on the right side. I have never been to Eco Bella before. All I knew about them was that they are a Gluten-Free and Vegan bakery. With that in mind, I wasn't sure about how tasty the cupcakes would be since no eggs or dairy would be in my cupcake. Never judge something before you try it, because I was floored by the half of a cupcake I just finished. The bakery is very small. You walk in with the bakery case in front of you, order, and leave. There isn't room for seating. I walked in, asked a couple of questions about the flavors (very friendly customer service!) and chose the large cupcake I had my eyes on when I first walked in the door. The one I chose was a pumpkin cupcake with chocolate frosting. Frosting is putting it lightly. This was a heavenly, ultra rich and dense chocolate. I'd like to start with the price. This cupcake was a bit bigger than the cupcake I tried the other day. It was also $2.50 more. The Eco Bella Bakery website says that large cupcakes are $3.25, but they were $4.00 each today. Let's get to the nitty gritty, folks. This cupcake was fabulous. The pumpkin flavor was just divine--slightly spicy, but so full bodied in terms of the flavor. I could almost taste each spice and it was really good on its own. I can detect applesauce or apple juice in this and it just marries so well with the pumpkin flavors. When the decadent chocolate frosting was added to this, though, they brought the flavor up into another dimension because the richness of the frosting balanced by the subtly of the pumpkin just made this one an incredible one. By the way, it was so delicious I thought I would eat the whole thing right down, but it is so dense and rich that I am saving the other half for the boys to share. The texture of this is wonderful. It is dense, but moist. I really, really enjoyed testing this cupcake and may have to try other flavors soon. For this to be Gluten-Free, Vegan, and so incredibly delicious speaks volumes about Eco Bella Bakery. I look forward to being a repeat customer. *For those new to our challenge, here are the "rules": Since I would grow very tired of eating cupcakes if I could only choose one flavor each time, I am not picking just 1 variety and comparing. 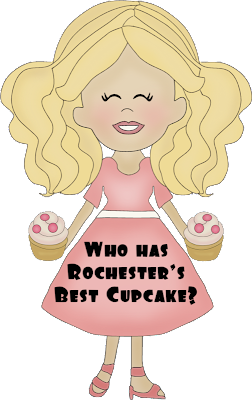 I want to find Rochester's very best cupcake (to me) overall. I will score each cupcake based on 5 things: overall appearance, creativity, texture, flavor of the frosting/toppings, and flavor of the cake part of the cupcake.